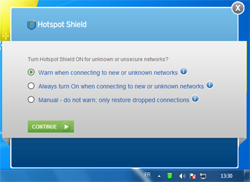 Hotspot Shield 3.42 software download for Windows 7, Windows 8, Windows Vista, Windows XP. Hotspot Shield is a free tool and service that lets you connect to the Internet via Virtual Private Network (VPN). Hotspot Shield is mainly geared toward those who want a more secure connection when accessing the Internet from public Wi-Fi hotspots. Most anti-virus software cannot shield you from Wi-Fi threats. Even with existing anti-virus software the odds are that your clicks are being tracked, archived, and shared. Use Hotspot Shield to protect your digital footprint. Version 3.42 may include unspecified updates, enhancements, or bug fixes.